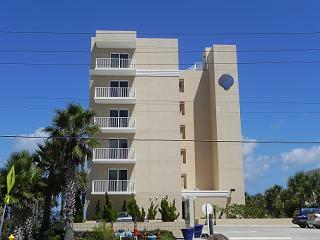 The very exclusive Captiva condos are located on the "no drive" beach in Daytona Beach Shores. Located between the Dunlawton Bridge and Ponce Inlet, residents will enjoy the peaceful surroundings that come with such a great location. With only 18 units in the building, this smaller luxury condo is a very private retreat. The community is tight-knit, and residents feel as though they are living in their very own gated community. Built in 2007, the Captiva condos feature 3 bedroom floor plans with balconies that provide breathtaking views of the Atlantic and the Intracoastal Waterway. Interior Features Include: volume ceilings, split bedrooms, granite countertops, and cable/DSL internet. Captiva Condominium's central location is just minutes from many local destinations. Nearby attractions include Sunglow Fishing Pier, Pure Life Surf School, Pirate Island Golf Course, Sugar Mill Botanical Gardens, and Memorial Park. Daytona Beach Shores is also only 20 minutes to the Daytona International Speedway and approximately 1.5 hours to SeaWorld Orlando, Universal Orlando Resort, and Walt Disney World.